The following is the conclusion of my interview with Tony, The Downeast Duck Hunter. When you interviewed me you shared with your readers that you have 2 young girls. How do you feel about them continuing the tradition of hunting and have they expressed an interest in following in your footsteps? If so, do you know how you will introduce them to the sport? My two beauties are my life and I would love to have them participate in my world of hunting, fishing, and the outdoors. My oldest is a learning experience, she loves the outdoors whether it be on the lobster boat, hiking in the woods looking for buck and doe sign, ice fishing, or freshwater fishing. However, I've also found that she has a sense of remorse for the animals I take. Most usually we release the fish and I must be very sensitive about how I present my take. On one occasion, she nicknamed a black duck “Cutie” so Cutie was processed after she went to bed. On any account, she's in my back pocket and most recently we scoped out the ducks that have congregated locally since the big freeze & the end of puddle ducking. She's got a knack for this, how far she goes with it, we'll see. No matter what, I will support her in any decision concerning a future participation in the sport. My youngest I believe, will be first in line for anything outdoors. But she is only two and it's hard to do the same with her as I do my oldest. She does get excited when she sees deer on the television, or on my deer cam. Both girls will soon be getting their life long hunting and fishing licenses. For $500, both will be able to take this opportunity with them wherever they go and I must say this is one of the few good things about our state government. Most of us who hunt dream of a once in a lifetime hunt, what is your dream hunt ? I've been on enough moose hunts for anybody, after drawing tags in 2000, 2003, and 2007 I'll let someone else have a crack. Deer hunting has become something I do and usually expect to get one every year, so pursuing another big buck doesn't seem so attractive. Sea duck hunting for many is a dream come true, but it is my way of life and something I've become adept at. I spend days taking friends out and leaving my gun in the case, I enjoy watching people fall in love with what I do. Take them out once and I've got partners for life, my duck hunting black book is full. So my dream hunt, it would have to be either a caribou or elk hunt with some great friends, good guides and plenty of time without worrying about what's going on at home. I have often thought about jumping on a caribou hunt with some friends, but the timing has always been bad. My duck hunting dream hunt would be in the prairie pothole region in Arkansas, Louisiana or Mississippi. I watch those guys on the outdoor channel calling those green heads in through the flooded timber and then the shotguns absolutely roar. You covet what you don't have, and even though I have wonderful sea duck hunting, I often wish for a duck hunting road trip with some great friends. How has blogging affected your hunting, if at all? And in what direction do you see The Downeast Duck Hunter blog moving towards? Blogging changed my world, not only recording a visual log that allows input from people all over the world, but much rather a reason to be more considerate of the finer details of my hunt. My father keeps a fine hunting journal, but I'm not quite as dedicated. Most of my hunts this year were put on the blog, plus practicing better outdoors writing in order to eventually publish a book has become something I'm serious about. By having my blog, I have connected with people that otherwise would have never had the chance to meet me. Our world is changing, someone like me as a traditionalist has become a visible “enemy” of others. I'm a living, breathing man who loves his country, family, and way of life. So when I work hard to make our country better and find dissent in how I play, the blogging network gives me people who share my attitudes, beliefs, and passion for the outdoors. For each and every person who has commented positively on my blog and for those blogs who I have commented on, thank you for letting me be a part of something very special. Little did I know that a blog would help define who I am. Thank you for your time and sharing your thoughts. Is there anything else you would like to share with my readers? I need to let your readers know that my biggest supporter in all my endeavors is my lovely wife. Often she is excluded from my blog, too often I write about my adventures and it's important for everybody to know that my greatest adventure is the one I share with her and my two girls. I want your base to know that I am a maker, not a taker and want the very best for our country and world. It has been difficult to be a conservative thinker in times that are changing, but I appreciate a great dialogue and will never dismiss an opinion as useless. I aspire to be a great representative for our tradition and encourage anyone to browse through my pages and drop me a line, even if it is to invite me to visit your blog. Finally, I would like to thank Terry for becoming such a great friend over these unique online means. There will be a day when I'll get her to Maine, make her tired of shooting eiders, stuffed full of lobsters, and get to see the sunrise before any other person in America. I want to add that in my eyes too, Tony has also become a friend over the past several months. I have thoroughly enjoyed tossing ideas back and forth about types of watercraft, decoys, ground blinds and much, much more. I look forward to continuing this conversation and hope that someday, I too can hunt Eiders, Scoters and the other varieties of sea ducks of the historical, Atlantic Flyway. Lastly I want to thank Tony for sharing his commitment and passion for waterfowling, his insights, experience and integrity. It would be an honor to share a hunt with such a gentleman. After following you on your blog The Downeast Duck Hunter, I have learned your methods of hunting on the Atlantic flyway differ greatly from our Pacific Flyway. Considering this can you explain how you rig your decoys, types and number and how do you keep them in place? Also what type of vessels do you hunt from ? 99% percent of my hunting takes place on the Atlantic Ocean with the majority of ducks being the American common eider, Northern common eider, surf scoter, black scoter, white-wing scoter, old squaw (long-tailed duck), bufflehead, black duck, golden eye, and an occasional mallard or goose. The biggest challenge when hunting the Bay of Fundy in Maine is working with the tide, wind and temperature (not necessarily in any particular order). I've spent my entire life thinking and practicing strategies to best enhance the hunt and the above three variables become the pillars of success or failure. My blog entry “Working a Different Wind” is a fair assessment of how I anticipate the above listed variables. Due to the nature of our tides, I use long lines of eider, scoter, and old squaws decoys attached to twenty-five pound mushrooms anchors. 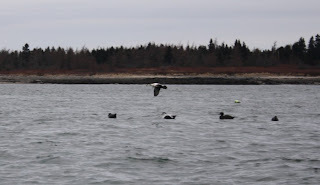 Typically, I run about 40 eiders, either on two separate lines or tied all together. Depending on the wind direction and tide, I may choose to let the line run on one anchor. Usually, I put one anchor on each end to assert the position of the deeks. For areas such as marshes, mud flats, or shorelines, I do use long lines for the black ducks, and also use individual anchors for some to give a more realistic presentation. I suppose that leads one to believe that some birds are a little more sharp than others. For me, one black duck is a more difficult duck to chase than one hundred eiders. I do have shadow decoys (silhouette), but don't use them very often. Most of my gunning is over plastic decoys, but my father and I have on occasion used our own that we made during the off season. In terms of my water fowling transportation, I hunt out of a variety of boats. 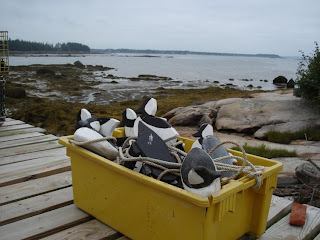 Since I'm a lobsterman as well, most of my tending craft can also double as hunting vessels. All are painted in a camouflage pattern and are very reliable. If they are good enough for lobstering, worming, clamming and other work, then they are certainly dependable for duck hunting. I have an 18 foot Lund Alaskan with a 40 horsepower Mercury. The motor was originally on my 16 foot aluminum, but my father and I found the Alaskan with a 25 horsepower Honda tiller. By swapping motors, we now have two very reliable watercraft. However, the 16 footer has been in moth ball so I recently picked up a Northern Flight boat blind in marsh grass for a little freshwater hunting. 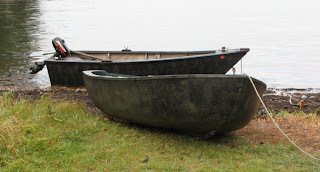 In addition, I have several smaller tenders for those hunts that do not require one of the aluminum boats. They range from eight to twelve feet and are great for negotiating difficult areas. We typically use these around mussel beds and ledges in shallow water. For these boats, I have a 3.3 horsepower Mercury or the ever dependable oars. I'm currently dying for the new Old Town Canoe Ambush model. It's a canoe/kayak hybrid with an 800 pound carrying capacity. If I can force myself to buy it I will, but it's hard to justify that purchase when I don't really need it. What was the defining moment that cemented your passion for hunting and who was it that passed this tradition on to you and how has this impacted your life? When you are the son of a local duck hunting legend, it's hard to not become the next generation. 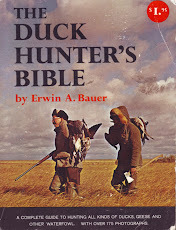 My father who has his own chapter in Ron Koch's “All Duck Hunters are Crazy” has spent his entire life hunting. When people come to our area and ask for old time duck hunters, he gets the referral. He laughs when he's thrown into the old timer category, but he also understands that his breed of hunter is a thing of the past. To better explain the previous statement, he lived in a time and place where ducks were a staple. There existed no bad shots, some hunters wouldn't shoot unless they knew they could get two in one shot. He used to sit in school as a youngster and listen to the hunters during the fall. With the number of hunters and how close the school was to the ocean, it's no wonder why he says he struggled in school. I shot my first rabbit when I was five years old, it was with a 16 gauge Ithaca pump and I remember pointing at the white spot in the woods while my dad braced the shotgun. One shot later, and I was heading home to show my mother what her son had done. That was an important day. However, the day that changed my standing as a passionate hunter was November 2, 1993. I had been skipping open gym basketball practice to go deer hunting and since I had been on the varsity squad the previous three years, getting in trouble wasn't going to happen. My father and I went into the woods after school, set up in a tree stand and waited. It didn't take long for several does to work their regular path towards a bedding area. But this day was different, a gigantic buck crashed through the thicket and stormed towards the females. Shortly thereafter, my 7mm Remington Magnum Weatherby echoed a blast that dropped the magnificent animal where it stood. Ten points and two-hundred pounds later, I had taken the one that had eluded so many. Since then, I have taken around ten bucks ranging from eight points down to little spike horns. As I have gotten older and time runs short, you tend to capitalize on any opportunity. However, no deer has ever matched that one. And to be honest, I've never been the same since. I took my first duck at age 11. A white-wing scoter cupped towards the decoys and I dropped it with my new Remington 870 Express. Having my father be so proud of me just made me want to keep doing well. He's my biggest fan and best mentor, although I've taken my craft to a different level with technology, education, and research, I still bounce every idea of off him. That concludes part 1 of my interview with Tony, The Downeast Duck Hunter. Look for part 2 later this week. In the meanwhile go check out his blog and the wonderful videos. Just a short note to remind readers of a very special interview beginning on Monday Jan. 26 with The Downeast Duck Hunter. This will be in 2 parts and I am sure you'll find it interesting as it involves hunting sea ducks of the famed and historical Atlantic Flyway. A place where at one time in history it was the mecca for waterfowling and the birthplace of punt guns and sink boxes. The early days of decoys carvers and call makers. Until then get your gear dried out, your gun cleaned and throw another log on the fire. 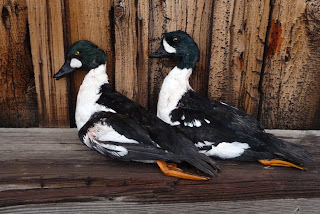 In the meantime here's a photo of a couple of Goldeneyes from my last hunt of the season. And there's more to this story than meets the eye. Note the 2 different species of Goldeneyes; Barrows on the right and Common on the left. It has taken me awhile to finally follow through on one of my ideas. Typically it doesn't take me nearly so long although this time I didn't want to have to buy several pairs in order to get it right the first time. So I asked my fellow bloggers for their expertise and wisdom. Fortunately I did get some very good information from The Maine Outdoorsman who has done a lot of snowshoeing. After several e-mails back and forth and more on line research I have chosen a company with over 100 years experience in the snowshoe manufacturing business. Tubbs Snowshoes and their Frontier model in 25" for my late season waterfowl hunting. For years I have trudged through deep snow carrying big bags of goose decoys, and exhausting myself in doing so. Thinking to myself that by the second or third day it'll be so much easier because I'll have created a path and won't be breaking through the snow with each step. Until then it's like taking 2 steps for each step you do take. It it also referred to as "post holing" cause it's like stepping in post holes. It requires a lot of balance and can be quite tiring. Your quads ache from catching yourself with a heavy load as you breathe deeper and remind yourself to take it slowly and pace yourself. It's only 200 yards your going, yet carrying 30 to 50 pounds in a foot or more of snow it seems like a lot further. As I'm walking I continue to look around and ask myself if there isn't a better place to set up that is closer, unfortunately the answer is usually no. So, even though for the time being most of the snow where I hunt has melted, I know that we still have several months of winter ahead of us still. There is a White Fronted and Snow Goose special hunt that starts in February and ends March 10. 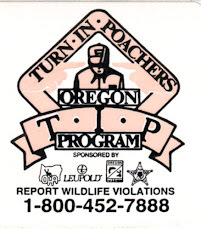 It takes place in Klamath County only and is a damage hunt. Since the inception of this hunt began, two years there has been a large amount of snow at that time. Last year it was un huntable until about three days before it closed due to the fact we had so much snow. There was no place for the geese to land except for where the ranchers and farmers were feeding their livestck or on the Klamath River. The geese wanted little green alfalfa shoots and didn't want to hang out on the snow. So I know better than to think that we're out of the woods just yet. In the meantime, I will be getting accustom to my new Tubbs Frontier Snowshoes and look forward to reviewing them in late February or early March. I am also having some custom work done to one of my large Cabela's decoy bags for this type of hunting. I will let you know how that works out too and with any luck get most of the bugs figured out next week. 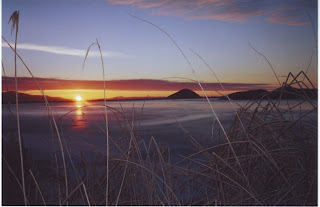 I will spend the last few days of the 2008/09 season looking at the wide open spaces of Klamath County goose hunting. The forecast calls for some weather in the form of light rain and snow. I hope the weatherman is right. Otherwise I don't think the geese will feel the need to move around very much. A little storm is all I need, Uh umm, I did say little. Awhile back I was approached by Sean of Outdoor Women's Journal. He had found my site and was interested in having me contribute to his site. I investigated OWJ and had many questions for him and after much correspondence we have struck an agreement to become contributors for one another. There is much I feel that OWJ can contribute to WHJ. Their articles range from hunting, fishing, birding, conservation, recipes and fitness. This venture will offer new contributing writers and stories that are first hand accounts of accomplished women in the field. There are many animals which I have not hunted yet there are women who have, and those are the stories I am looking forward to sharing with you. Ultimately I am looking forward to continue to promote women's hunting and be a source of information as well as inspiration. I value my loyal readers and look forward to hearing your feedback on the new stories to come. There has been a warm front here in Oregon for the past week and a half which is helping melt the the snow and ice. So I am becoming a little more optimistic that I can return to Lowlands for an attempt to hunt Canada Geese. I don't know if there are many, if any in the area of where I hunt. Yet as the saying goes, "you won't know unless you go" means that I will venture south for a firsthand survey and at the very least go for some long walks with Jet. She is thoroughly bored with lounging around and I am missing being in the field. When I last departed Lowlands it was in early December after the first Arctic Blast had hit and everything froze up tighter than a drum. Including the cabin pipes and I am still a bit anxious about what I'll find when I get there. 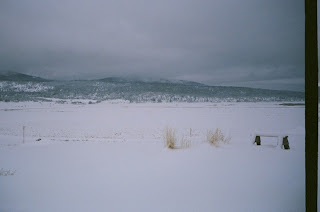 The Klamath River has a ribbon of open water now, more so in the middle of the river with shelf ice extending out 20 or more yards from the banks. These are extremely dangerous conditions for all parties. I have hunted the river during these conditions although only with a hunting partner and not alone. Hunting in these conditions by myself requires me to be very selective in my shot choices. I have to have the bird land anywhere but on the river ice and it needs to be dead. If it is crippled and lands close enough to the river to get on the ice before I get to it, than I've lost that bird. I will not send Jet onto the ice, because the risk is just to great. Each year hunters lose their four legged companions when they break thorough ice or sieze up when swimming in icey waters. Nothing short of tragic. Mostly it would be passing shots at Goldeneyes and other divers. Scaup is now closed for the season here. Anyhow, we all know how far those divers can carry after they've been shot. Seen them skip on the water and sail another 20 or 30 feet just from their momentum. I may get lucky and have a few flyovers that I can drop on the river dike. That would be great and Jet would be ecstatic! Often when there have been geese around the area I have set my G and H shells in the field just behind the river dike and then hunkered in the ditch 20 feet from the river's edge. Waiting for the geese to swing over the open water and take a look at the decoys. Usually the hunting pressure has eased a bit and the geese are less wary and in range. Even if the geese don't like my set or aren't interested in landing in the field they often will set in the river. It is between these two zones that presents a small window of opportunity. I have spent many a chilly late season days laying in ditches listening for the distant call of wild geese and I miss being there. Often all it has yielded me was a cold backside and a long day of solitude. Watching Ravens, Magpies, Hawks, Eagles, Marsh Wrens and the occasional Vole scurrying about. Listening to the pack of dogs that lives across the river bark and the cows mooing when feeding time approaches. With my calls hanging around my neck I cusp my hand around my Iverson call and give it some wind making sure I haven't lost my touch. The call sounds good to me, just hope I get to do some calling for real. As I lay there reminiscing about past goose hunts I am still optimistic. It's all about putting your time in and being in the right place. Knowing this keeps my optimism up, cause eventually the odds will swing in my favor when the two line up. Being in the right place at the right time. Until those lines merge I am only paying my dues and it is with this knowledge I embark on another wild goose chase. This is the most simple stew I have ever made and it is delicious. you can vary the meat according to what you have on hand. The same goes for most of the veggies too. That's the beauty of crock pots! Just about whatever you throw together is sure to please. Into crock pot empty the canned goods and turn temp on high. Put 2 tbls. olive oil in cast iron skillet and brown stew meat, then add to crock. Chop garlic and toss in. Cover and cook on high til it starts to bubble around the sides of crock, then turn to low for 4 to 5 hours. Add pepper about 10 minutes before serving. Garnish with a dollop of sour cream and a sprinkle of cilantro. This makes many servings, just how many I am not sure . I guess approximately 6 to 8. What I like is that I can freeze a couple containers for later or my next hunting trip. This is a hearty satisfying meal and it only takes me 20 minutes to throw together. A lot of meals for a modest effort. Bon Appetit! First let me wish everyone a Happy New Year and for goodness sakes let's hope it's better than 2008! I think we can all use a little optimism and good fortune in this new year. The weather has been more than challenging the past several weeks. O.K., yes I did ask for a big cold blast from the far north back around Thanksgiving. Uummm, and we got slammed for 3 plus weeks with snow and single digit temps leaving my hunting area looking like an ice rink. Ultimately ending my duck hunting after the first weekend the storm hit. Well, I will make adjustments in the future and be more specific as to what type of weather I am asking for. Although I hope those of you down in California are enjoying getting out after those birds. Otherwise I am looking forward to venturing back to my happy hunting grounds in the next week or so. We are now having a big thaw and all the snow is melting. Thank you, thank you, thank you. The roads are no longer a sheet of thick ice or black ice and travelling is once again looking favorable without risking life, limb and dog. My body is finally recovered from the several hours of snow removal I was doing on a daily basis. Which included the roof eaves as well. Nothing like working with your arms over your head to get a really good shoulder workout in, geeze-lu-eeze! I think in the coming week I will be able to drive to the cabin, at least try blazing a trail in the wet slushy granular snow. They got 2' down there and this warm front has been quite modest there. So it may be a bit longer for conditions to improve and become huntable once again. I still have some new ideas to try on late season geese, provided there are some in the area. I have contemplated buying snowshoes for late season hunting and yet I am still without. I think they would help make the trekking easier, carrying my bag of G and H goose shells plus my Avery ground blind tied to it along with my gun and all the other stuff I take for a day of goose hunting. Anyhow, no snowshoes yet. Perhaps I will just continue to approach it as I have for the past 30 years. That walking in 18" of snow(post holing) is a good work out. Well DUH! Only problem is that the older I get the less it takes to get a good work out. So I guess it'll just be a really good work out. It doesn't take me to long to get to where I set up and I have learned how to better pace myself. After all it's not a race and it is something to be savoured. Ah yes, just savour each step and breathe deeply. Boy, and I thought I had short legs, poor Jet gets high centered in the snow. So, if any of you have tried snow shoes for winter hunting, please let me know how they worked for you. Also any suggestions as far as brands, sizes etc. will be appreciated. I do have a plastic sled of sorts, but it can be improved upon. Lastly, a snowmobile is just out of my price range. Looking forward to hearing any and all thoughts on carring gear and how you do it for goose hunting in a foot or two of snow. Thanks and Happy New Year!